Is your company stuck in a rut? It might be time to get some outside help. Many companies don’t want to consider candidates outside their career sector because all they see are the drawbacks. They see the need for training and time wasted, when all they want is someone who can hit the ground running. But are these companies ignoring a valuable resource? Candidates outside your industry can help your company see things more clearly, think more creatively and bring innovative ideas along for the ride. 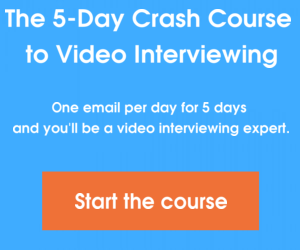 Video interviewing is a great way to speak with these candidates and find out if they’re your next superstar employee. Before bringing in a candidate for a scheduled face-to-face meeting, employers can speak with candidates about their transferable skills. Scheduling a traditional in-person interview can often be a pain, especially if a candidate is located far away or has a packed calendar. This can seem like an especial waste of time if the candidate’s transferable skills turn out to be negligible. If you’re looking outside your industry sector, it’s important to know how a talented candidate’s skills will translate into the job you’re looking to fill. Do they have the communication skills needed? Do they know the software they’ll be using every day? Video interviewing can allow you to address these questions without wasting time scheduling a face-to-face with a candidate who can’t tackle the position. When looking at a candidate outside your industry, it’s important the candidate is ambitious, driven and ready to learn. These are all things which can be easily ascertained in the video interview. If the candidate’s qualifications aren’t dead-on with the position, their personality and dedication become a much more important factor when considering long-term success. Did the candidate apply to this job because it would give them a steady paycheck? Or did they apply because they’re looking to change career paths and see your company as a place to learn and grow? The video interview is a great way to see just how committed the candidate is to this new industry and your open position. One of the reasons you’re looking outside your industry is because you’re tired of the same old myopic thinking. The kind of thinking which can easily get your company stuck in a rut. When video interviewing an outside candidate who seems great, it’s important to focus on creative approaches to old problems. If your candidate isn’t a great creative thinker, than you’re losing a lot of the value of hiring outside your career sector. It’s possible being divorced from your industry’s rat race helps the candidate see things more clearly. Without being hedged in by how things are always done they can dare to dream up innovative ideas. You might be focused on the trees, but it’s important your outside candidate can see the forest. Asking specific questions about how they have creatively problem solved in the past is a good way to find out about their skills during a video interview. Another great way is to pose them a real industry issue your company is facing and ask them for a creative solution. Just because the candidate doesn’t have as much experience in your industry doesn’t mean they don’t have great ideas on how to fix problems and find better solutions. Candidates outside your industry can be a great resource and a valuable source of new ideas. These applicants aren’t stuck in the old ways of thinking and can bring your company some much needed fresh blood. They can also bring along their ambition, drive and dedication to succeed. Thanks to video interviewing, it’s easier than ever to weed out candidates that won’t work from those you should take a closer look at. Instead of wasting time scheduling interviews with candidates who are all wrong for the job, you can instead give candidates you might not have considered for an in-person interview a chance to impress. You never know, these candidates might just be carrying around your next great idea. What are some ways you can use video interviewing to hire outside your industry? Share in the comments!